At the lowest point of the December 2018 decline in the stock market, just 13% of the 3,000+ stocks on the NYSE traded above their long-term 200-day moving average. The recovery in the intervening months has been relentless; straight up without pause. Today, a much healthier 72% of NYSE stocks now trade above their 200DMA, a significant improvement. However, with each rally over the last 12 months, fewer stocks have been participating in the market advance. Prior to the sharp correction in January 2018, 92% of NYSE stocks were trading above the 200DMA. The stock market plunged in February but then recovered, making a new high later in the year. However, just 82% of stocks traded above the 200DMA at the September 2018 peak. Then the Q4 2018 decline took stocks to a lower low and now we are experiencing the latest recovery. This time, just 72% of NYSE stocks are trading above the 200DMA. 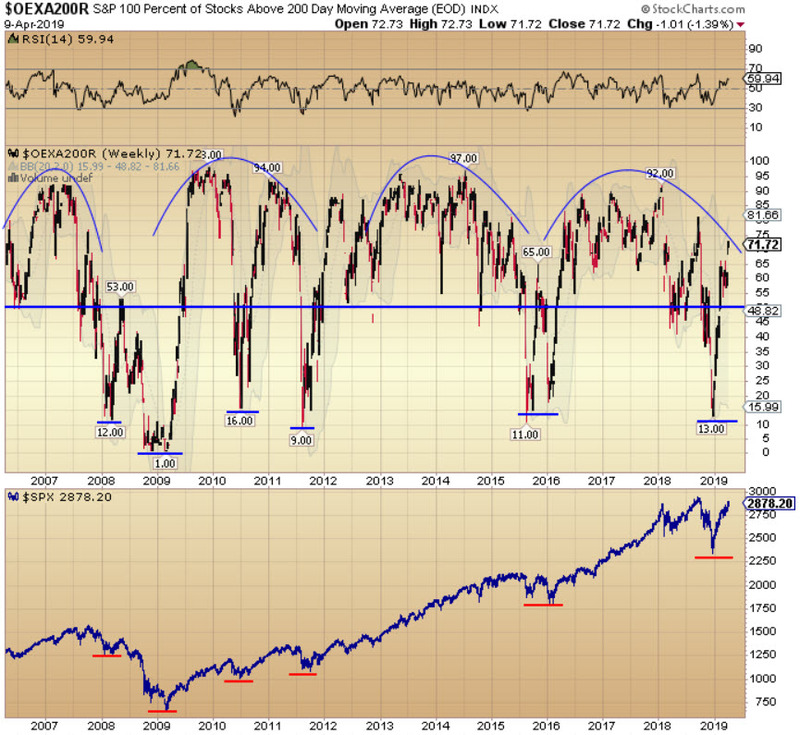 This is a subtle deterioration that is taking place out of sight of many market participants. We could break higher in the next few weeks and the bulls will be vindicated. I think we need to at least re-test the December lows before a more meaningful rally can commence.